The above statement would be practically unobtainable, but it does outline ideal painting conditions. To insure a long life house paint job with latex requires common sense and a little cooperation from Mother Nature. Time of Year: Late Spring or early Fall will afford the best results. Temperatures are mild. One has to watch the threat of rain or high evening humidity. Summer is also a good time to paint, but one should avoid painting when the thermometer goes over 90°, and always avoid direct sunlight. If at all possible, never use latex during “Indian Summer.” Those days in the late fall are the worst time to paint. Any freeze-thaw cycles subjected to a latex paint film during its first two weeks of cure can conceivably shorten the life of the paint job. In short, the latex house painting season starts after the last frost in the Spring and runs until about two weeks prior to the first expected frost in the Fall. Time of Day: An early morning start never hurts, but a late finish and you are asking for trouble. Generally one should stop painting a couple of hours before sunset, especially during those days of spring and fall that are cool and humid. Glycol bleeding can result if conditions are just right. Temperature/Humidity: Temperatures in the seventies are ideal. Above 85° F. latex tends to dry too quickly and may not properly wet out the surface. When temperatures drop below 60° F. latex curing is retarded, and below 40° F. coalescence is severely hampered. 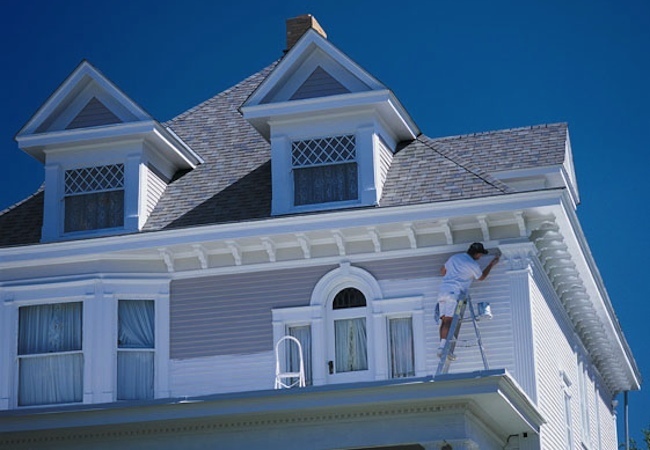 One should not paint if the temperatures may drop to 40° F., even 24 hours after application. When humidity reaches above 70% the evaporation of water from the latex paint film is suppressed. Avoid painting on those days when humidity is excessively high.